Homeowners, builders and contractors' venting knowledge base. Search by category/subjects, if you can't find answers here, please call us at (888) 443-7937. Additional tips for proper Dryerbox® installation — and avoiding pitfalls — can be found here. Every day, we field quite a few general questions on proper dryer venting--some of which are outside the scope of installing a dryerbox. This new forum is very new, so content is limited. With your help, however, it can become a great resource for sharing additional solutions to questions across a much broader spectrum of issues. Please do check out the forum and add new content even if you find the answer you needed below. Together, we can help a lot of people. And, who knows, a little good karma may find its way back to you. is right for my application? What are the specifications of the Dryerbox? Answer There are five (5) different models of The Dryerbox - Model 425, Model 350, Model 400 (Retro-Fit), Model 4D, & Model 3D. There are three models that favor an upward direction of exhaust and two models that favor a downward exhaust direction. The Dryerbox is deep drawn molded product made from 22 gauge aluminized steel weighing between 4 and 5 pounds. For complete details and specifications about The Dryerbox models, please click here to visit the "Product Specification" page. How can I as the "Builder" or a "Sub-Contractor" save money or benefit? Answer The builder will save money by being able to provide an additional net square foot or two of living area at a cost maybe less than $20. The laundry room will appear larger to prospects and call-backs due to dryer related problems will almost be eliminated. When the HVA/C Contractor installs The Recessed Dryer Vent Box in a new custom home he precludes the necessity of the one 90 degree pipe in the wall. In cases where the distance to the exterior is longer than code allows, The Dryerbox provides a five foot credit by eliminating one of the 90's. The contractor will walk away from the job with a tall feather in his hat, knowing the homeowner will benefit from better efficiency and a lot less chance of a fire caused by lint build-up. Many times during punch-out, the HVA/C Contractor will have to replace the ell penetrating the drywall due to a previous careless trade kicking it or breaking it. The Dryerbox is unsusceptible to damage during the remainder of construction. How much does the recessed dryer vent cost? Answer Please visit our "Product or Store Locator" page by clicking here. We have over 1,500 supply houses that carry The Dryerbox. Although we sell them online here, it is our preference and likely yours to be able to purchase them locally. In most cases the price will be less than what you will pay from our web store plus shipping. If you are not able to purchase "The Dryerbox locally, we are hopeful that you will let us know so we can advise your local distributor of your interest in them carrying the product. Please call us at (888) 443-7937 or email to let us know. Please visit our Fast, Secure and Friendly Online Ordering page by clicking here. Why don't you make a plastic version to save money? Answer With the cost of oil (used in plastics manufacturing) at all time highs, it may not surprise you that the minimal savings from using plastic can not come close to justifying the sacrifices in quality and safety required. At its already very competitive price, we think you will agree that the added value (and peace of mind) of only providing a metal Dryerbox more than makes up for a few cents savings. Here are some of the top reasons metal is best. Building code officials have exhibited some hesitancy to allowing a large combustible breach to the wall assembly directly behind a frequent source of ignition (see Dryer Fire Articles). Many jurisdictions disallow the use of plastic receptacles behind the dryer, and insist that the penetration into the wall assembly be properly fire-blocked as per the 2003 International Residential Code R602.8 item 4. Over the years, the polystyrene used to manufacture these receptacles discolors and becomes brittle due to the heated environment behind the dryer. Rotor-zip-cutting around a plastic receptacle is difficult and melts on the cutting bit. Typical wall or trim paint does not adhere to polystyrene and will require masking. Plastic is fragile, requires a series of support tabs, is awkward to install, and it would require a trim ring that is brought back out to the job at trim-out. Plastic is not approved for a one-hour wall, does not meet NFGC for non-combustible material for venting and does not meet IMC 913.3 for dryer clearance to combustibles. Actual laboratory tests have shown fire penetrating the wall assembly within 72 seconds with a small-scale test furnace and a plastic dryer receptacle. Potentially there may be some risk related to the use of these receptacles. Is The Dryerbox UL listed? Does it have any formal building or code approvals? Answer All five of our new construction DryerBox models have gone through official testing and have received UL Classification and subsequent one hour F & T Rating. All five of our models can be installed in a one hour wall assembly constructed of wood or metal framing provided certain additional installations of drywall and or insulation are accomplished. A summary of these requirements may be found at this link and the full UL listing details can be viewed at this link. Do you have any information on "Clothes Dryer Building Code"? Dryer vent systems shall be independent of all other systems and shall convey the moisture to the outdoors. Terminations shall be a minimum of three feet from property line and 12" above the ground and not exhibit any type of screen. Vents and duct connections shall not be connected with sheet-metal screws or fastening means which extend into the vent. Exhaust vents shall be equipped with a back draft damper and no screen. Vents shall be constructed of minimum 0.016-inch-thick (0.406 mm) rigid metal ducts, having smooth interior surfaces with joints running in the direction of air flow and having a minimum interior diameter of 4". Flexible duct and the respective connectors shall not be concealed within the construction. The maximum length of a 4-inch (102 mm) diameter exhaust vent shall not exceed 35 feet from the dryer location to wall or roof termination, and shall terminate with a full opening exhaust hood. A reduction in maximum length of 2.5 feet for each 45-degree bend and 5 feet for each 90-degree bend shall apply. Installations where this length is exceeded shall be installed in accordance with the dryer manufacturer's installation instructions. Click here to view the actual 2012 IMC - International Mechanical Code (section 504) and the 2012 IRC - International Residential Code (section 1501). Click here to view the "Dryer Venting Guidelines". I read a mechanical code that indicated a "cleanout" was required in the clothes dryer exhaust. What does that mean? Answer Correct, the new "International Mechanical Code" specifically states on "Section 504.3 Cleanout - Every vertical riser shall be provided with a means of cleanout." The intent of this code element is to provide an accessible means to remove the lint accumulation that would fall vertically (settle) to a low spot in the vertical run. If a means already exist to access this, (i.e., the usual ell through the drywall or a Dryerbox) then a cleanout is not required. Our engineers' professional opinion is that The Dryerbox meets the requirements as a cleanout opening for the dryer exhaust system. Click here to download/print our "Sealed Engineers Letter" regarding the cleanout issue. What are my options if the distance to the outside is greater than code allows? Answer You do have options. Currently most if not all mechanical codes allow for longer exhaust duct runs than 25 feet if the manufacturer of the dryer appliance specifies or allows for lengths exceeding the local governing mechanical code. In most cases you'll have to provide the specs and related literature at time of mechanical rough and final inspections and may be required to have the respective appliance installed at final, but please concur this with your building inspector. My findings: I selected a mid-range priced dryer from each of the four big dryer manufactures, I reviewed each of their respective installation guides, and what I found will surprise you. Maximum exhaust distances with two elbows ranged from 26 feet to 44 feet, but were achieved by using hard rigid snaplock pipe in the walls, and a "box hood" or "louver style" weather hood. Click here to view the comparison of four dryer manufacturers' installation specs. The other options are using the Fantech - Dryer Boosting In-Line Fan or the same as straight pipe Dryer-Ell, and you can check our line of dryer accessories available at our Fast and Secure Online Ordering by clicking here. Our inspector wants to know what affect a slightly "ovalized" exhaust might have on CFM (Cubic Feet per Minute). Answer To start, the dryer's CFM data can be obtained from the OEM's operational manual and is mostly a function of the size of the motor. That information would be relevant to standard 4" round Snaplock pipe at 12.43 square inches for the interior of perfectly round pipe. Compare that to the very slightly oval openings for models 425, 4D and 3D with 12.14" which would be 2% less than perfectly round. And the more oval model 350 (designed to fit in 2X4 walls where the pipe has to be compressed to fit in the wall) has 11.65" which is 6% less. The resulting impact on CFM would, therefore, be nominal. Where do I actually locate the box when I am installing it? Answer Almost all clothes dryers locate the exhaust port in the same location; at the bottom of dryer's rear panel and in the center. With that in mind, The Dryerbox is properly installed if set right on the bottom (sole) plate (2x horizontal member at bottom of wall framing) just about touching the rough floor. Locate the center of the box as close to the center of the proposed appliance as possible. The drywall contractor will use his zip-cutter tool to cut out a neat opening requiring only some caulk by the painter. No frame or escutcheon is necessary. Do not turn it upside down or hold it above the proposed baseboard. The Dryerbox only needs three (3) points of attachment. Additional framing is not needed but a wood block sometimes is helpful in "pulling up" the one unsecured corner. I've seen or heard that The Dryerbox was installed above the baseboard? Is this correct? Answer No. Many job superintendents or HVA/C subcontractors think they are doing their trim carpenter a favor by installing The Dryerbox, 5 or 6 inches above the floor when in fact they are taking away the main benefit of using The Dryerbox. Installing the unit above the baseboard eliminates the ability to move the dryer appliance all the way back against the wall because the flex hose now has to bend upwards to get to the receptacle area. The Dryerbox was designed to be installed sitting on the rough floor. The lower the better as all American standard dryers vent at the very bottom of the rear panel and in the middle. I am installing your Dryerbox on an exterior wall, what do I need to know? Answer If you are in a cold climate region it is important to include adequate insulation behind The Dryerbox to minimize or prevent freezing and sweating that occurs from the difference of interior and exterior temperatures. Before I go too far, I want to point out that if a washer is located on the exterior wall, and the dryer is located right next to it, then it is likely the wall is "double framed" due to the water lines required for the washer. Water lines have to be adequately protected from freezing, so in most cases this wall was double framed, and if so, will work fine for a model 425 or 350. Double framed means there are actually two sets of framing. Both are insulated but enough separation from the exterior surface is provided respective of the waterlines. If your exterior wall is 2x6 frame construction, this will provide 1.25 inches of space behind the model 425 Dryerbox to install insulation (if it is a model 350 there will be 2 inches of space). This space must be adequately filled with the best R-value material you can find. I suggest cutting a piece of "duct-board" used in heating and AC duct work. I also recommend that you use a model 425, 4D or 3D as these models provide a round hole or port, which is more efficient than the oval port respective of the 350 which is made to fit in the tighter wall frame. If your exterior wall is 2x4 frame, and you are in a cold climate, which is an uncommon combination, you should not use The Dryerbox as there is no room for insulation. For the actual installation on an exterior wall, these notes should be considered: cut at least a 10" piece of Snap-lock galvanized pipe to transition from The Dryerbox port to an elbow. From the ell, install what pipe is needed to get you to the side-of-house termination. Remember: penetrate the top port of The Dryerbox with about 2" of 4" Snap-lock pipe and secure with the silver tape, sealant or foam. A "close-ell" may be useful and should be considered over the typical elbow as it uses up less room. See the Close-ell at this link. What happens if there is a stud right at the location where the center of the dryer will be located? Answer Remember, the standard width of a dryer is 28" and most dryers are offset from a side wall a few inches. You should locate the box as close to the suspected center of the dryer as possible. Moving a stud is generally not necessary unless the center of the appliance is the same as the center of the stud and you need to move the appliance all the way back against the wall. Even if the box does not line up perfectly with the dryer exhaust, it still provides for better drying efficiency, less chance of fires and a few inches closer than without one. Can I secure only one side and the bottom of the Dryerbox to framing as opposed to securing all sides to framing and blocking? If so, does it affect the fire rating? Answer The Dryerbox is constructed of 22 gauge aluminized steel making it very rigid so there is no need for additional blocking. Regarding fire ratings, only one side and the base were secured to framing when the Dryerbox was tested at UL to achieve its classification as a fire stop device. The other side was not blocked. Therefore, no blocking is required. The Dryerbox is strong enough to withstand fire conditions without special framing. I have two dwelling units separated by a rated floor assembly. I desire to target the common space between the floors to run my dryer duct to the exterior. Is this ok? Answer The two dryer duct runs need to be separated and within their own rated assembly. If the floor assembly is an open joist assembly, the two dryer ducts will not be separated. If the floor joists are solid, and the ducts are in different joist spaces, there would be no problem with this design. They just cannot combine or share the common space and still maintain the rating between units. Can I install one in an existing wall or house? What is involved with a Retro-Fit (Model 400)? Answer Our "new construction" Dryerbox exhibits a nailing flange that is designed to go under the drywall and a rim extension. It is to be applied directly to the stud and bottom plate. If the conditions were right in an existing home and there were no obstacles (wires, pipes, gas lines, bearing walls studs) in the area where The Dryerbox was to be installed, and the 4" exhaust line was venting up, then the installation of our Retro-Fit unit would be a good consideration as it will likely save you some drywall related work. If you were comfortable working with drywall, and maybe had some other drywall work to do in the house, I would consider installing the new construction box. See a picture of a new construction box in a remodel by clicking here or view the "Instructional Sheet" for the Retro-Fit box by clicking here. The Retro-Fit box is not an easy installation and requires some investigation work prior to ordering it. In many cases there may be an obstacle that prevents its installation. Cutting an observation hole in the drywall is recommended prior to ordering. Click here to see a rendering picture of the Retro-Fit box. Do I need a special fitting to connect the flex hose to The Dryerbox that has the oval port (pipe)? I just moved in a new home and I'm having trouble connecting the vent pipe (flex) to the oval outlet. What do you recommend? Answer No, a special fitting is not necessary for the connection of the flex to the penetrating galvanized pipe that is oval shaped (occurs on Model 350 to accomodate tighter wall frame). All you have to do is compress or "ovalize" the flex pipe to fit over it. It will work, but you'll need a worm-drive type hose clamp to conform to the oval shape and hold the flex secure. CLICK HERE for a video showing installation tips for "ovalized" duct. What are some options in terminating the gas line into the Dryerbox? Answer The gas knock-out provided in the Dryerbox is 1 inch in diameter and permits ½" galvanized pipe to penetrate or a CSST Termination Fitting with a Jamb nut to securely affix the termination to the receptacle. In the case of using ½" galvanized pipe, it is best to wrap the throat of the pipe that will come in contact with the receptacle with black vinyl tape. In the case of using a Termination Fitting, viewing this image might better show the proper installation, click here. The termination fitting is used with corrugated stainless steel tubing. A jamb nut secures the termination fitting to the receptacle and is the preferred method of installation. Additional resources can be found on the Clothes Dryer Gas Line Termination installation page. The gas port can be enlarged or relocated easily with a step bit. An approved ball style shut-off valve must be used. If I am not able to attain The Dryerbox by the time my heating/ventilation subcontractor finals his rough, what can I do? Can you provide measurements for the location of the termination point of the snaplock pipe? Answer Great question and I pass this comment along almost daily for builders and homeowners who just learned about The Dryerbox but have the drywall contractor showing up in a few days. Locate the termination point of the 4" snaplock pipe 18 1/4" above rough floor. Locate the center of the pipe 3 1/2" from the left stud if attaching the unit to the left stud and 6 1/4" from the right stud if attaching the unit to the right stud. Review some of the pictures and drawings to become familiar with the terms and descriptions used in this paragraph. For stack washer and dryers, which model is best and at what height should the Dryerbox be located? Answer For stack washer/dryer combos and also dryers on pedestals, the ability to install one of our up models (425 or 350) up-side-down becomes an attractive option. The advantage of using the "taller" upward draft Dryerbox is its height. The recoiling or accordion reflex works much better with a longer box. Our downward draft Dryerbox (4D and 3D) are best suited for non pedestal dryers. The 425 or 350 Dryerbox receptacle will work upside down if care is taken in locating the Dryerbox so that the exhaust port of the dryer lines up with the taper end of The Dryerbox. This way the hose collects in the receptacle in a relatively straight line and the receptacle is able to house and collect the length of flex. Drawings of 4 different stackable dryers indicating their respective exhaust port. Dryer on pedestal going up and going down. Stackable washer/dryer going up and going down. 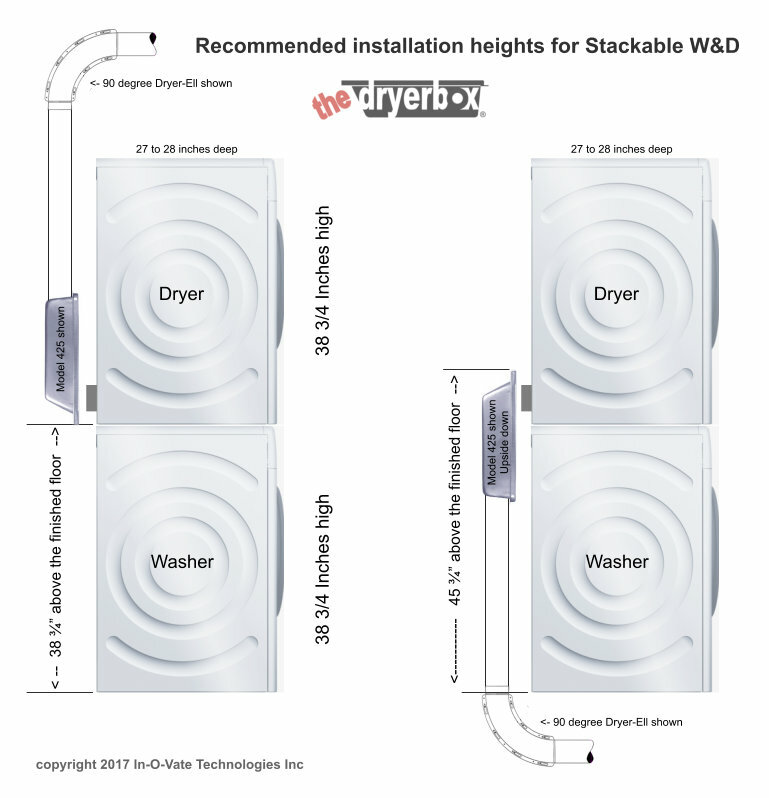 For a stackable W/D installation, what is the preferred location to install a Dryerbox? Answer Standard or typical measurements of a Washer and Dryer that can be stacked is 27 Inches wide by 38 3/4 Inches high. Also standard or typical is the location of the dryers' exhaust port: center of unit (left to right) and the bottom of the 4-inch exhaust port is 2 inches above the bottom of the units' support legs. Therefore, the very bottom of the models 425, 350 or 480 should be 39 ¾" above the finished floor, assuming you are venting in an upward direction. If venting downwards with a stacked dryer, it is our recommendation to not use our "down boxes" (4D and 3D) but to use our upward venting models (425, 350 and 480) installed upside down and the mounting heights would be: 45" to the upper (highest) rim of the upside down Dryerbox. Note: the desired effect of the Dryerbox receptacle is to accommodate the collection and the connection of the dryers' exhaust conduit (transition hose). At one end of the Dryerbox is the connection to the wall and at the other end is the connection to the dryer. Use the entire length of the Dryerbox to store the recoiled flex hose. How do I install the box if I am running my exhaust pipe down to a crawl space or floor joist? How about if it's to a side wall? Can I turn the box upside down? Answer The magic of the original up venting Dryerbox is how the flex hose is supported from the top of the box. When the homeowner is behind the dryer connecting the three feet of flex transition hose between the dryer and the wall outlet, and then moves the dryer back into place, the flex duct will recoil, accordion, pull on itself to leave the homeowner a sweeping, efficient, flowing result. Turning our up version (model 425 or 350) upside down creates the circumstance where the two ports (one from the dryer and the one coming through the bottom plate) are competing for the same space. Three feet of flex hose is not going to act like a little kids Slinky and make a perfect 90 degree bend down. It's likely going to "spring up" or bellow, filling the receptacle with flex hose going every which way, and resulting in a very inefficient and unsafe mess. The combination of its size and width prevent this model from working upside down. We now offer a "Down Box" receptacle that provides enough width to service the port coming through the bottom plate and the exhaust port behind the dryer. Our models 425 and 350 can be used to go down by adding two 90 ells above the receptacle. The port or hole in the top is offset to the left to accommodate two 90's (ell's) piggybacked together that will direct the 4" galvanized pipe down along the side of The Dryerbox. With this configuration, all the components will fit within the 14 1/2" space left by 16" on center stud spacing. If your best route is horizontal, to a side or exterior wall location, install one 90 degree hard pipe bend in the wall above the box and route from there out. Remember, if you have to have any bends, it is best, safest and most efficient to make them hard-pipe bends. Make sure you do not terminate the dryer exhaust in the attic, crawl space or garage. It is very unhealthy, both for you and your house. Make sure it is exhausted outside. Check our "Photo Gallery" for illustrations and pictures. Additional tips for proper Dryerbox® installation — and avoiding pitfalls — can be found here. My dryer takes longer than it used to. What could be wrong or what should I do? Answer The dryer exhaust duct may be blocked, lint screen may be fully covered, or the heating element is malfunctioning. You should inspect the termination port of the dryer and the wall or roof jack. Look for birds nest or clogged openings. Most importantly, feel for proper exit velocity of the air leaving the vent and look at the interior walls of the duct. If your dryer vent is blocked, it is a fire hazard and it would be better for you not to run the dryer for any extended period. Start by pulling the dryer out, take the flex hose off at both connections and clean and vacuum everything you can reach. Click here to view the "Dryer Venting Guidelines". Over the past several years, many duct-cleaning services specializing in dryer vent cleaning have sprung up. It is likely you have one in your town. Look in the yellow pages under "Duct Cleaning", call a nearby HVAC supply house or do a web search. One reputable company that comes to mind is Dryer Vent Wizard. They have many locations across the U.S. and are an authorized Dryerbox installer. I need to terminate my dryer exhaust duct in the attic some where and I hate to penetrate the roof. What are my options? Is there a product that will terminate on the underside of my soffit? Answer Yes. Deflecto makes a very innovative patented product called "The UNDEReve® Vent". Do not allow your dryer exhaust to vent into the attic. Visit our Fast and Secure Online Ordering by clicking here. Or visit your local "Home Depot" to find this product. What other products compliment The Dryerbox or have something to do with the laundry room? Answer The "FloodSaver" - Washing Machine Surround - An attractive all-in-one water protection system that will protect homes, apartments and condominiums from all kinds of washing machine floods ­ no matter how worn and leak-prone a washing machine becomes. "The UNDEReve® Vent" manufactured by Deflecto is for clothes dryer & bathroom exhaust venting that easily mounts on the horizontal plane of the eave and provides a great way to exhaust forced air from your attic space. "Fantech - Dryer Boosting In-Line Fan" is an option when duct length is a problem. We have a line of dryer venting accessories available at our "Fast and Secure Online Ordering" by clicking here. Do all dryers "vent-out" of the dryer appliance in the same place? And where is that? Answer Except for the stackable combo washer/dryer units and some European units, most dryer appliances exhaust through a 4" port at the very bottom of the rear back panel, and it is located in the center measured from side to side. Is it o.k. to vent a clothes dryer into a basement, crawlspace, attic or garage? Answer No. It is NOT recommended to vent dryers to an interior space. For you, your furniture and your families health and many other viable reasons. Drying a typical load of clothes via a standard tumble dryer produces 10 pints of moisture. Here is a great link about venting clothes dryer indoors. Also, click here to read a great reference article on mold. What is the difference in the numerous types of dryer transition hoses? Which flex hose is best? Answer Basically there are three different types of transition hoses available to purchase and install between the dryer and the in-the-wall exhaust system. Namely, the white vinyl spiral bound, the spiral type multi-ply foil flexible duct and the semi-rigid flexible aluminum duct. Absolutely do not use the white vinyl spiral bound flex as it is very unsafe and prohibited by most building codes and appliance manufacturers specifications. Click here to view the comparison. Why is the hole offset to the left? Can I get a Dryerbox that has the hole on the right side? Answer The port or 4" hole is offset to the left to allow adequate room for two 90 degree elbows put together and still fit within a 16" on stud spacing. We do not offer a model or version with the hole offset to the right but for an order of adequate size (one pallet) we can special order that request for no extra charge. On occasion, we can provide small quantities without a hole. Click here to see a customer story explaining how this can work. Why do you not sell a white powder coated new construction box? Answer Good question. The mill finish aluminized steel with its microscopic holes from being stretched or deep drawn, allows for good adhesion of paint. After we manufacture the box, we spend much effort in making sure it is completely clean of any oil residue as we anticipate that your painter will paint The Dryerbox when they spray the walls and trim. If it was powder coated the painters paint wouldn't stick, and your painter would have to cut-in around it or bag it off. It works best if he sprays The Dryerbox with the same primer and paint that he uses to paint the trim work. What gauge or thickness of metal is the box constructed out of? Can it be painted? Answer The new box is manufactured out of a sturdy 22 Ga. aluminized steel material that is 100% clean of any oil residue and will require minimal if any paint preparation due to its microscopic porous finish. I see both your Dryerbox and your Dryer-Ell are "Green," what does that mean for me the builder, and for my homeowner. How do I determine its credits? BuildingGreen, a leading authority in Green Building, established threshold criteria for products used in construction for acquiring the title of green. Our products are LEED-compliant, helping to contribute valuable points toward LEED- certified projects. (http://www.buildinggreen.com/index.cfm). "LEED," for "Leadership in Energy and Environmental Design," is a system that recognizes the environmental performance of buildings at four levels: Certified, Silver, Gold, and Platinum. (http://www.buildinggreen.com/menus/leed.cfm). How many house fires are caused each year by inadequate dryer venting? Answer According to the U.S. Fire Administration (Division of U.S. Department of Homeland Security), clothes dryers were involved in an estimated 15,600 U.S. structure fires, fifteen deaths, 400 injuries and $99 million in direct property damage, annually, between 2002-2004. The leading cause of clothes dryer fires was lack of maintenance (70 percent). Lack of maintenance would include restricted vent pipe and lint build-up. The correct installation and use of the recessed dryer vent box should greatly lessen the risk of lint build-up and exhaust pipe restriction. Mainly because it prevents the dryer from being pushed so far back that it crushes and cuts off the exhaust hose. Visit our "Fire Hazard" information page by clicking here. Or read articles about "Awareness and Clothes Dryer Safety" links by clicking here.